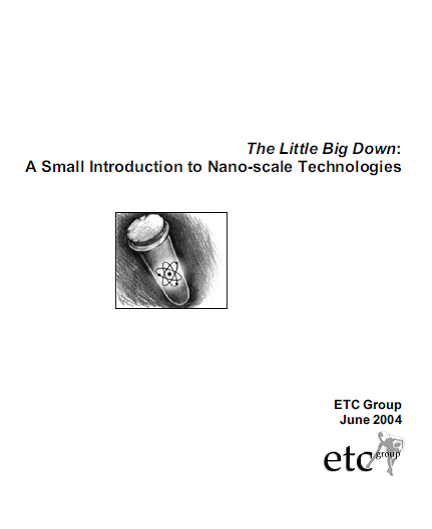 This brochure, The Little Big Down, is based on a larger ETC Group study, The Big Down: From Genomes to Atoms. From several different vantage points, nanotechnology – a set of techniques used to manipulate matter at the scale of atoms and molecules – looms as the highest, widest and most powerful technological wave the world has ever faced. The turbulence that will accompany the nano-wave has breathtaking societal implications, especially for poor and marginalized communities. It will upend markets for labour and raw materials and change the way we live, eat, work, wage war and define life. Some predict that nanotechnology will trigger a new economic and cultural utopia combining material abundance, sustainable development and profit. But history suggests a different scenario. In recent decades we have witnessed the privatization of science and a staggering concentration of corporate power that has undermined democracy and dissent throughout the world. Nano-scale manipulations offer unprecedented potential for sweeping monopoly control of elements and processes fundamental to life and material resources. In short, nano-scale technologies are poised to become the operative strategy for corporate control of industrial manufacturing, food, agriculture and health in the 21 st century.